Vintage engagement rings are a popular choice for women who are looking for a unique and distinctive piece of jeweler. 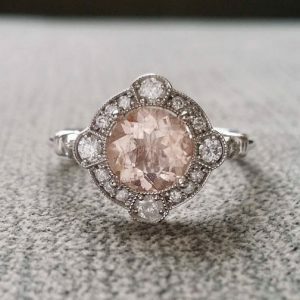 Women from all walks of life come to stores such as Cynthia Findlay Antiques in Toronto looking for antique rings with a touch of class and timeless beauty that is tough to find with many modern pieces. For a certain type of shopper, an antique engagement ring is the ideal choice to show off their individual style and personality. But along with stunning looks and classic styling, there are practical reasons for women to consider antique engagement rings. One of the main reasons is that they are the ultimate in being environmentally conscious. Because they were mined and created decades ago, you can feel confident that no new resources have been stripped to create your ring. The same thing goes for the ethical issues connected to many engagement rings, particularly those made using diamonds. It can be difficult to know whether new diamonds rings are actually made from diamonds traded fairly. You can avoid this issue by purchasing older engagement rings to eliminate ethical concerns about your diamonds being recently mined in poor working conditions. Along with the ethical and environmental benefits of buying vintage engagement rings, there are also financial benefits. Many antique engagement rings can be purchased for extremely affordable prices. This is especially true for rings from eras where the predominant styles involved more affordable gems than diamond. Cynthia Findlay Antiques is a leading seller of vintage and custom jewellery in Toronto. It has been in business since 1978 and is a member of the Canadian Jewellers Association.